subordinate to the animated versions. Even when (like Panchito Pistoles, José Carioca or even Snow White) they did turn up in comics first, it was usually just an attempt to give the film a little pre-release publicity. But in this case, there was nothing to publicize. The newspaper cartoon was all ever there was of Walt Disney's Merry Menagerie. 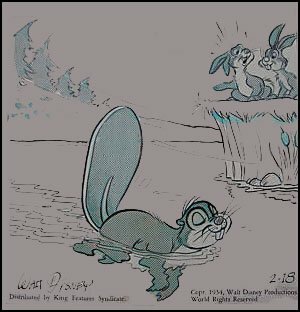 Like other Disney newspaper comics, such as Mickey Mouse, Silly Symphonies and even Uncle Remus & His Tales of Brer Rabbit, this one was distributed by King Features Syndicate. It consisted of a one-panel gag each day, about ordinary animals. No continuing characters  no ducks, no teddy bears, not even a repeat appearance by yesterday's animal. There didn't seem to be any Disney identification at all, with the exception of Walt's signature at the bottom. Tho Walt signed it, he no more created it, than he was solely responsible for anything else since Oswald the Lucky Rabbit. The actual creators were Disney staffers Bob Karp (whose script work includes Carl Barks's first comic book) and Bob Grant (whose later credits include art on Scamp.). Together, they launched Merry Menagerie on January 13, 1947. Karp and Grant were among the more stable creative teams on Disney comics. They were still doing this one when it ended, in 1962. Today, it's scarcely remembered at all, let alone as a Disney product. Text ©2011 Donald D. Markstein. Art © The Walt Disney Co.